The smallest of atoms is a tricky member to contain. Have you noticed how when you fill a balloon with helium after a couple of days it's laying limp on the floor? That's because helium is so small it sneaks through impossibly tiny pores in the latex mesh. Even ballons made of Mylar, which is basically aluminum foil, can't contain it for the same reason; the closely packed arrangement of the aluminum atoms leave an imperfect lattice with micro-sized tunnels through which helium can escape. And helium is twice as large as hydrogen so you can imagine how much more difficult it is to prevent from leaking. To the eyes of an atom the glass in an ampule must seem many times more impressive than the Great Wall of China did to the first barbarian who approached but, we're sad to say, even this glassy fortress cannot prove permanently impermeable to fleet-footed hydrogen. On the other hand, unlike a rubber balloon, glass is inflexible so with every atom of hydrogen that manages to escape its glassy prison the pressure inside diminishes relative to the outside and, there being no smaller atom than hydrogen with which to equalize said pressure, the hydrogen loss eventually stops completely as long as the integrity of the ampule is maintained. 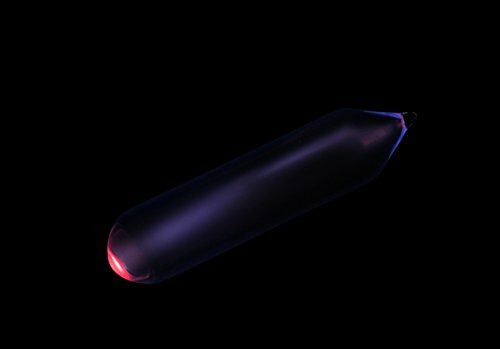 Hydrogen gives off a feeble indigo-blue glow when electrified. If a neon sign were replaced with hydrogen the effect would look pretty and eerie but too weak to appreciate unless completely dark... which kind of defeats the purpose of a sign.